Michael F. Sciortino Sr. is a keynote speaker, trainer and successful business owner with over 30 years of experience in developing and delivering proven, time-tested dynamic marketing applications in retail, wholesale, traditional and alternative investments. Once in a while, a book comes along that defines the key issues in an industry and offers appropriate strategies and ideas to solve those issues. This is that book. 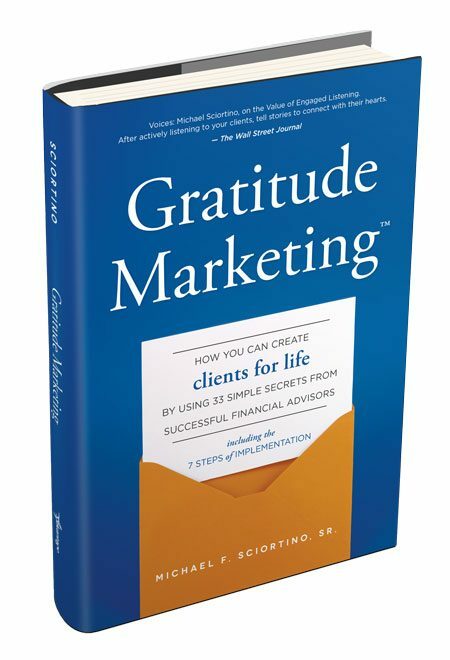 Mike Sciortino’s book, Gratitude MarketingTM, gives you all of the tools you need to quickly increase your client retention, boost referrals and grow your revenue. Clients respond when you connect with them on a personal, human level rather than talking at them with traditional marketing tactics. The ideas shared in Gratitude MarketingTM have achieved one thing for the savvy financial advisors who have used them: consistently produced results. You will discover how to grow your practice through gratitude.